Have you ever set a goal for your Business and did not reach it? Have your dreams been shattered by unforeseen situations and circumstances? If you answered yes to any of the questions above, this post was written exclusively for you. In fact, If you set goals in the past and did not reach them, its OK. Goals are meant to give you a sense of purpose and direction in business. Furthermore, when you set goals, be flexible, because your plans could change as the needs in your community changes, without much warning. In 2013, I noticed, that there was a great demand for infant/toddler care, but I was not willing to meet the need, because my desire was to have a preschool program and a before/after school program only. Furthermore, my desire for only wanting preschoolers and school age children, was impacting my enrollment in a negative way; it was hurting my Business financially. After getting 5-10 calls a week for infant/toddler care for an entire year, I decided that it was time to alter my goals and meet the growing demand in my community. My infant/toddler program will be opening by March 1, 2014! As you can see, I was committed to my heart’s desire, yet I was willing to alter my goals in order to meet the needs in the community. My Plan B- Find a Building that’s large enough for my Summer Camp, Preschoolers and Infants. Are your goals self -serving? Are your goals designed to meet the needs of your customers? Will your goals lead to Business growth? Are you willing to alter your goals? Are you trying to accomplish too much to fast? In summary, when you develop the mindset that your Business is in existence to meet the need in the community; more families will come to you, because you will offer what they need. However, if your Business is designed to meet your needs, you could be leaving money on the table. My decision to add infant/toddler care, will cause my enrollment to be consistent 12 months a year and not just during the summer months. What’s Your Plan B? 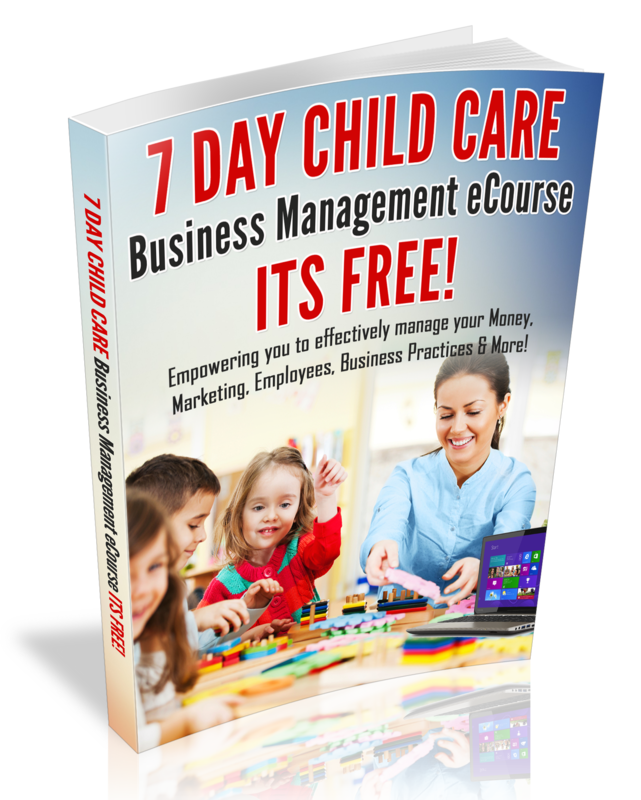 I hope this post has inspired you to be flexible with your goals and build a Child Care Business That meets the demands in your community. I look forward to your feedback. Leave your comments below. Discover How to Effectively Market your Business With My Marketing 101 kit. One of the toughest task of a leader is to get the people who follows him or her to catch their vision. Have you ever tried to implement changes in your childcare business and they were rejected by parents or staff? Those changes could have included: tuition increase, new curriculum, your goals for the year, fundraiser changes, classroom changes,etc. Whatever your vision or plans may be, I know how disheartening it is to have your vision rejected. If your vision has been rejected, I must let you in on a little secret; people must buy-in to the Leader before they buy into the vision. If your Vision is often rejected by parents or staff, it’s simply because they have not bought into you. I remember when I decided to move my home daycare to a center. Out of 7 children only one child came with me. I asked the families that decided not to come with me, what inspired them not to come with me and their answer was; because we wanted our children in a home daycare not a center. In other words, the parents wanted me to care for their children, not someone else. In fact, the one parent that came with me, she really trusted me with her son and I was her son’s first caregiver. Eventually, another one of my long time families, decided to come along, after visiting the center. The family realized that I was still a big part of their child’s care and they were compelled to enroll their child into the center. Have you ever had an employee to reject your vision or plans? I have and the secret to winning that staff member’s vote is by finding out why he or she rejects the vision. Also, work on creating a win-win relationship or making a decision on if the employee is right for your team. 1. Work on building relationships. With parents, start discussions at pick-up or drop-off time to show them that you care. Make an effort to talk with staff members daily to see how they are doing and strive to learn something about them. 2. Be honest and authentic and develop the trust of parents and staff members. People tend to have more respect for someone who is open and honest with them at all times. 3. Hold yourself to high standards. If you believe in being professional at all time, be professional. Also, if your goal is to offer the highest quality of care, demand that those practices be honored at all times. 4. Give parents tools to be better parents. Equip your staff members to do a better job. 5. Help them to achieve their goals. For example, my assistant director is a girl scout leader. Every year I support her girl scouts by allowing her to set-up a cookies booth at the center. I also get free cookies every year! For my staff, I find out about their personal goals and strive to assist as much as I can. 6. Everyone is a leader. In fact, parents are leading their children and teachers are leading kids or other teachers. Moreover, this is why it is vital that you also promote leadership development or simply helping them to grow as leaders as you grow. In summary, if you want others to buy into your vision, follow the 6 -steps above and they will buy into you! Take Your Leadership to Another Level in the 21-Day Mastermind e-Club. Join Now!